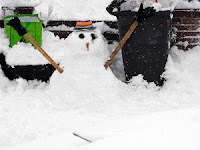 Okay, a bit of snow was fun; the kids enjoyed themselves, built snowmen, lobbed a few snowballs. But now, after either being marooned or taking our lives in our hands to venture out, the novelty has definitely worn off. Yesterday, I had to be given a lift up the hill to the Hampshire Farmers' Market office by Toby and his tractor after my Prius slewed across the narrow access road and needed to be dug out. Overnight, another couple of inches fell on top of the white-out still left behind from last week and that meant one more duvet day for everyone in our little lane. Fortunately, my husband had done a supermarket sweep round Tesco last night so at least we're not starving. The government and local councils say they can't set aside cash to pay for a 'just in case' severe weather event and so our roads were not gritted, post has not been delivered, bins have not been emptied and recycling has not been collected. And we live on the edge of a town for heaven's sake, not in the rural wasteland. It's funny, I'm sure they don't say the same thing about potential terrorism - "it doesn't happen often so let's not bother preparing," and yet the bad weather has cost families and the economy much money and in some cases, people's lives. But with global warming likely to bring more unpredicable weather, isn't it about time they did get prepared? Our council says it's stationed some bin trucks at the local Sainsbury's so people can take their stinking rubbish in their cars to be disposed of, but it's far too dangerous for their workers to get to people's homes. Or out to grit the roads either, apparently. Will we see a refund in council tax because our bins haven't been emptied since before Christmas or because the council has refused to grit roads, making it hazardous for us to get to work? I won't be holding my breath.